As you may have guessed by reading various pages on this site, fitness in golf is extremely important! If you ever needed proof of exactly how important fitness in golf has become, then look no further than the PGA Tour. The PGA Tour utilizes Depuy-Mitek Fitness Trailers at all of its top notch events. In fact, they actually have a handful of them to travel to PGA Tour, Women's, and Champions Tour events! At most tournaments there will be two separate trailers, one for fitness and one for therapy. In case you were wondering, Depuy-Mitek is a subsidiary of the pharmaceutical company Johnson and Johnson. Golf fitness has become so important to the top golfers in the world, that they will visit these trailers everyday, if not multiple times per day. I've read numerous reports of golfers making frequent pit stops at the training trucks, whether its between practice sessions or before/after their rounds. Some will go in and stay for upwards of a hour, while others will only be in for a few minutes just to get the kinks worked out. To give you an idea of how large these trailers are, when fully deployed they measure 16’5” wide, 14’2” high and 60’ long. Inside each of these trailers, you will find state of the art aerobic and fitness equipments, capable of providing a rigorous workout for any participant. 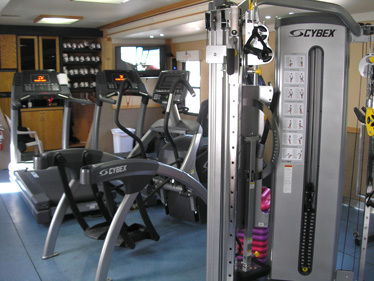 They have free weights, exercise machines, resistance bands, and stability balls to name a few. They also employ a full time rehabilitation staff comprised of trainers, physical therapists, chiropractors, and physicians. As mentioned above, there also is a therapy truck in addition to the fitness truck. Here you will find treatment tables where players will get stretched, massaged, and manipulated. Golf fitness has also progressed to the point where golfers will also employ their own private trainers that will travel with them from event to event. The pros have realized how important fitness and weight training for golf have become. Have you?